What do you make on a Sunday night when groceries are low and motivation to cook is even lower....yes #EggCurry is the solution. Here's what I do, since I am allergic to eggs. 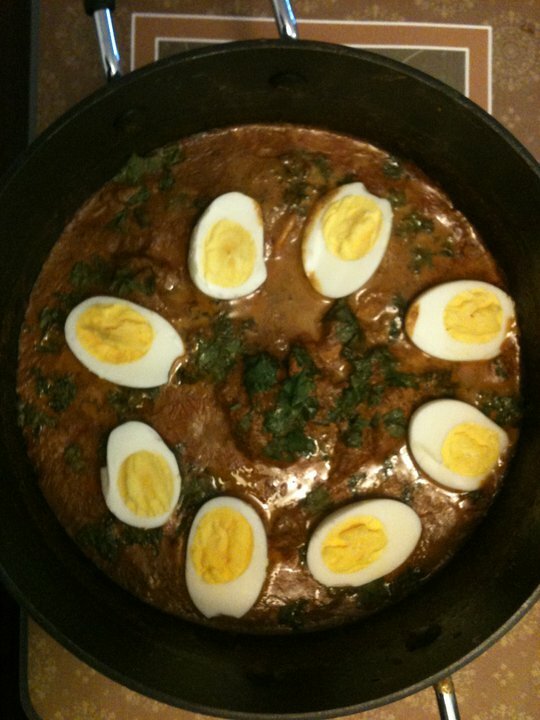 I divide the gravy into two parts and add a can of tuna to mine and make it with eggs for Mr N.
There are many variations of an egg curry, but the one I, or rather Mr N liked is this one. Heat 1/2 tbsp oil in a pan. To that add the sliced onions, cloves, poppy seeds, cinnamon, coconut or KL masala and black pepper corns. Roast till onions turn slight golden brown. Let the mixture cool a bit, then blend into a paste. Use some water to blend into a smooth paste. Add the finely chopped onions, asafoetida, chilli powder and turmeric. Cook till onions are translucent. Now add the paste and cook for 2-3 mins stirring continuously so nothing burns. Add some water if needed. Now add any masala of your choice, I add fish masala, mix and cook for a minute. Add enough water and cook covered till it boils. This is where I split the gravy into two. I add half of it to a smaller pan and add my can of tuna. Cook covered for 5 mins. Please skip this step if you are making this just with eggs. In the remaining gravy and add 2 boiled eggs. Cook covered for 5 mins and pour some gravy over the eggs to give more flavour. Serve with Roti or steamed rice. So that's our dinner on a Sunday night. Do give this a try and let me know how you like it.